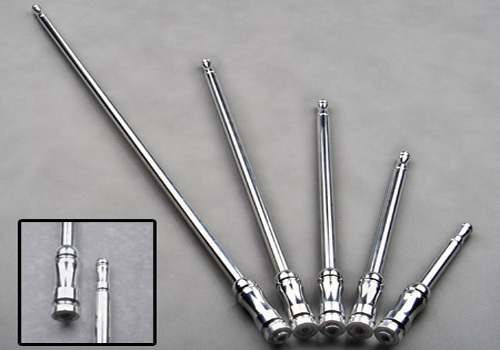 All Sales The Big Stick Antennas Billet The Big Stick Antenna, The Big Stick Antenna, All Sales The Big Stick Antenna, Dodge Ram Billet Antenna, Dodge Dakota Billet Antenna, Dodge Durango Billet Antenna, Chrysler Aspen Billet Antenna, Dodge Challenger Billet Antenna, Dodge Charger Billet [All Sales 4200 Big Stick Antenna] - $29.95 : 3rd Strike Performance, Your Source for Late Model MOPAR Performance Parts and Accessories! Boost your radio signal and add a touch of style. You'll be surprised how adding a new Dodge Ram antenna will upgrade the look of your ride. Easy installation and a variety of replacement antennas listed below. We carry a range of antennas ranging in size from 8" all the way up to 21". Swap out your old or broken antenna with a sharp, custom styled replacement. All Sales Manufacturing offers only the highest quality custom antennas, each engineered for solid reception and an original style. With several lengths and styles to choose from, you're sure to find the perfect addition to your vehicle. All Sales has created the ultimate antenna for your ride. "The Big Stick" antenna series features premium construction and engineering and a 7/16" solid shaft. Polished to a brilliant shine, this antenna not only looks great but will enhance your radio reception as well. Available in the following lengths: 6", 9" 12", 15" and 21"
Upgrade your factory antenna today to a more elegant one from All Sales.